This wonderful salad is a beautiful combination of tastes and textures. Sweet strawberries with crisp and tart fetta cheese ,bitter toasted almonds and super spinach leaves which are full of iron which all us women need plenty of. Oh my god this salad really is to die for. Every time I want to impress my skinny friends with a salad that not only looks beautiful but tastes really good too this is the one I choose. If (sadly) strawberries are not in season where you live you can opt for apples instead, I would use a ‘pink lady’ or a ‘fuji’ myself but granny smiths would also work. If you or your friends are concerned about the dressing having too many calories you can use a zero carb raspberry vinaigrette as an alternative dressing. To give you an indication of just how could this salad is last time I bought it to a tailgating party one woman ate and I kid you not, five bowls! This recipe makes about 10 serves, is ready in only 15 minutes and contains about 350 calories per serve. In a skillet over medium-high heat, cook the almonds, stirring frequently, until lightly toasted. 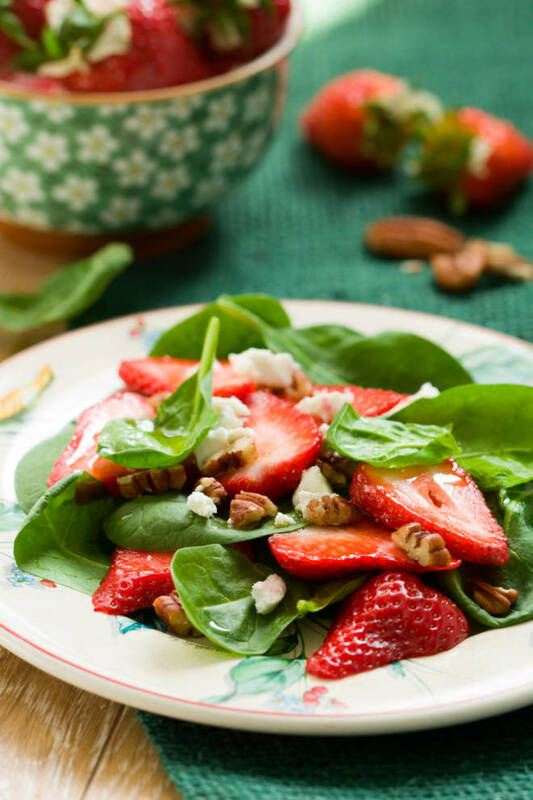 In a large bowl, toss together the toasted almonds, romaine lettuce, strawberries, and feta cheese. Cover with the dressing mixture, and toss to serve.